Durasoil is a revolutionary, state-of the-art dust suppression solution that is created using a gas-to-liquid (GTL) technology. Air quality is a serious issue with strict regulations around the country. Our products, Durasoil and Soiltac, help companies reinforce air quality compliance. 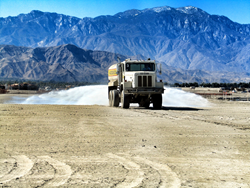 Soilworks provides engineered solutions to meet the broad needs of the dust control and soil stabilization industry. Whether the market is commercial, industrial or military, Soilworks has the innovative tools, unmatched technical support, and environmentally friendly technologies to fulfill specific requirements. Soilworks’ performance-driven portfolio of industry-leading products include the Patented U.S. Dept. of Defense Surtac®, Soiltac®, Powdered Soiltac®, Gorilla-Snot® and the newly patented Durasoil®. Soilworks’ international sales network, global distribution centers and integrated customer service provide an ideal platform to satisfy all its customers’ needs. Get to know Soilworks better at http://www.soilworks.com or call 1-800-545-5420.